The pen and ink artwork, colored with muted pastel create a deck full of imagery that is both appealing and accessible to all tarot readers. For each of the 78 cards, the booklet by Norbert Lösche, provides interpretations on the individual level, the community, and the cosmos. Several sample card layouts are also described. About Norbert Lösche The creator and artistic designer of the Cosmic Tarot was born in 1951 and currently lives in Aachen, Germany. He is a self-taught artist. He originally began his professional life as a surveyor, then studied the history of art before taking up painting. 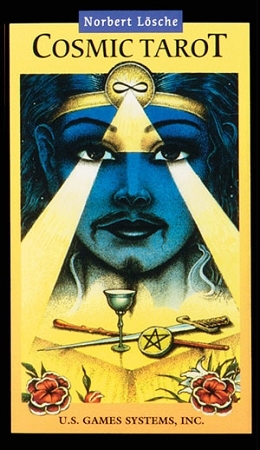 It was an interest in the esoteric that led him to the tarot -- an interest which found the perfect means of expression in the creation of the Cosmic Tarot.